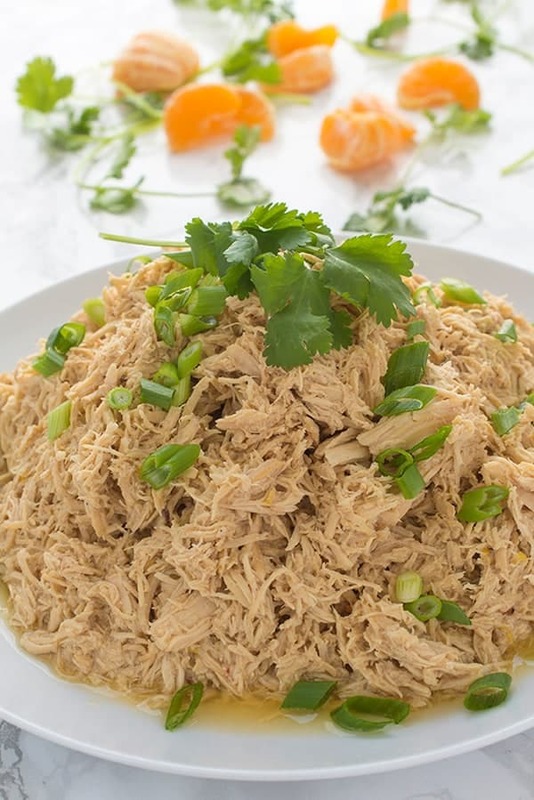 This Asian-inspired slow cooker shredded chicken recipe is sweet, tangy and super versatile. 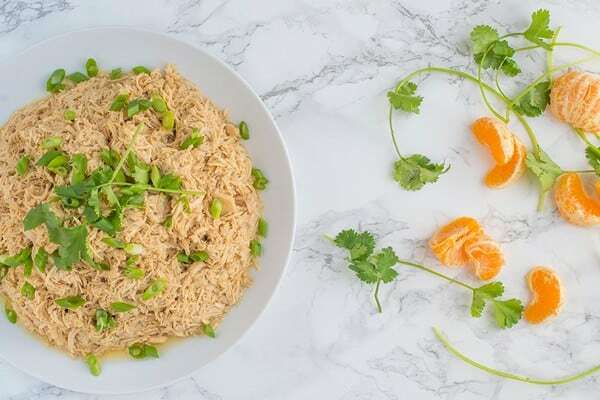 We are kicking off our citrus-inspired weekly meal plan with a work horse of a recipe: Asian Citrus Slow Cooker Shredded Chicken. 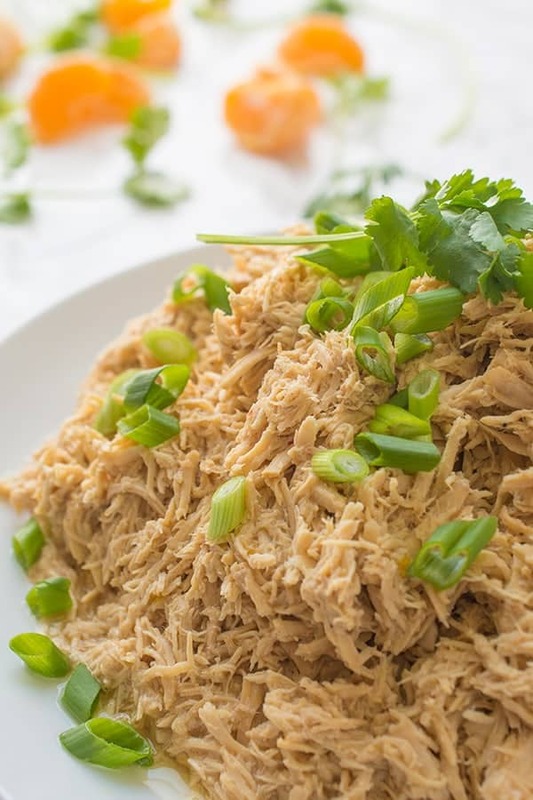 As you’ll see in this free downloadable meal plan and grocery list, this large batch of shredded chicken is going to make healthy eating a breeze all week long. 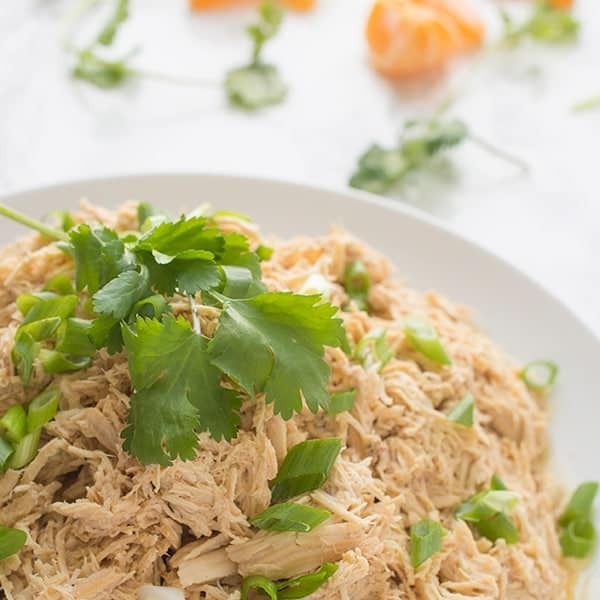 Sweet, tangy, and full of flavor, this slow cooker chicken recipe is made with fresh orange juice, soy sauce and toasted sesame oil. On the evening you prepare the chicken, I suggest serving it over brown rice with a green salad on the side. 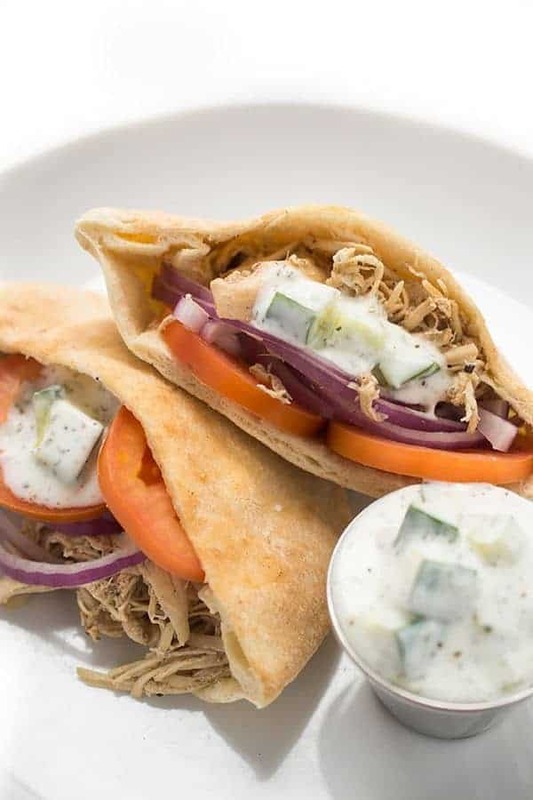 It would also be delicious stuffed into sweet potatoes, tossed with pasta, served over roasted veggies or over jasmine rice with my Japanese Quick Pickled Cucumbers. We also love tossing it into chicken broth for a quick soup or using it in enchilada bakes. The options are truly endless. 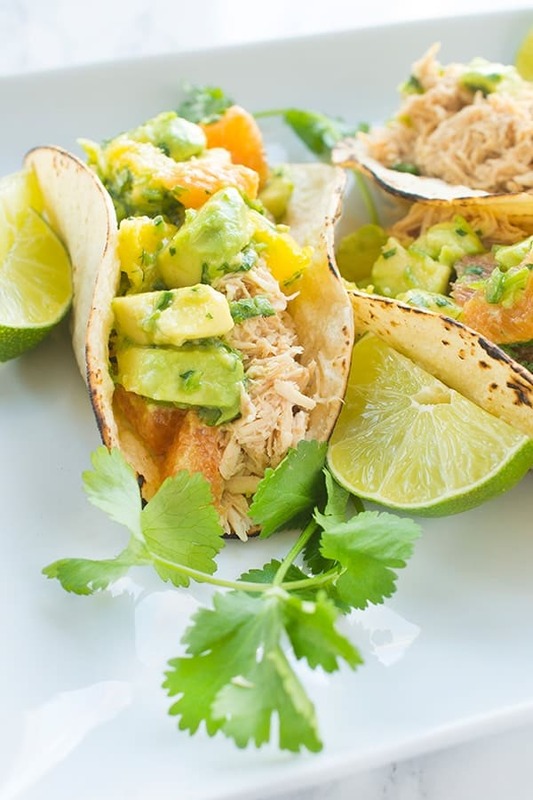 Stay tuned tomorrow where I’ll be sharing recipe 2 of this citrus inspired weekly meal plan: Chicken Tacos with Citrus Avocado Salsa. #TacoTuesday never tasted so good! Sprinkle chicken breasts evenly with salt and pepper and place in the bottom of the slow cooker insert. In a small bowl, whisk together all remaining ingredients (chicken broth through five spice powder) and pour over the chicken breasts. Cook chicken on Low for 6-8 hours or High for 3-4 hours. 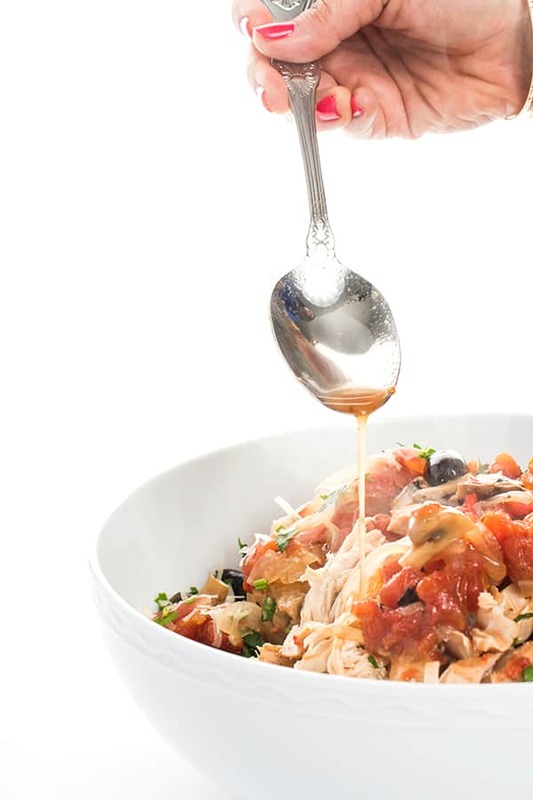 Chicken is done when it shreds easily with a fork. 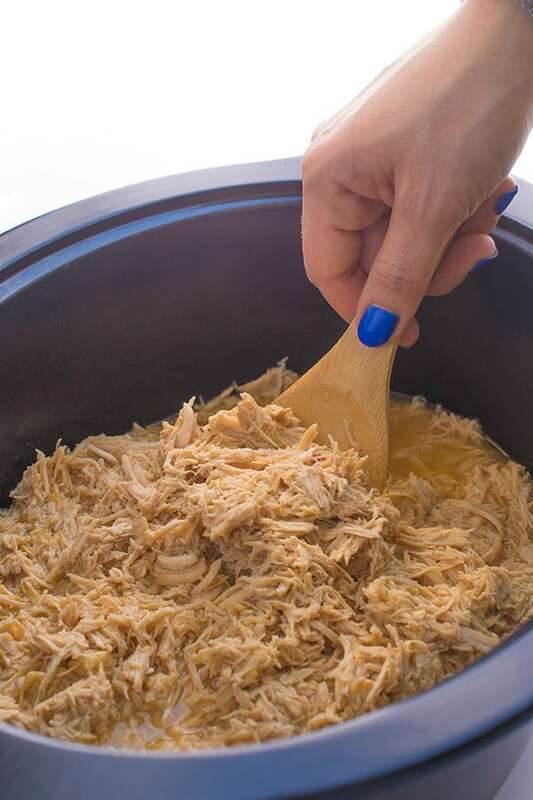 When chicken is done cooking, shred with two forks to serve. 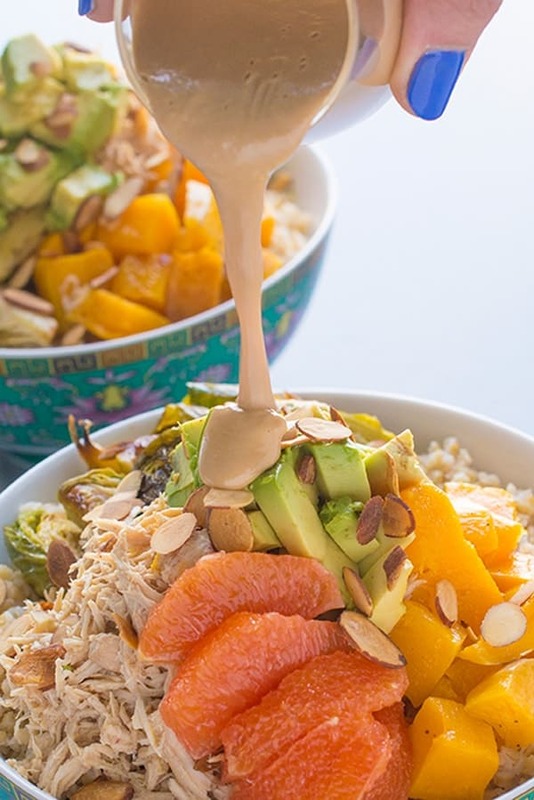 For even more Healthy Slow Cooker Recipes, head over to Pinterest! How much is a serving cooked? And should I reserve the juice for anything? 4 ounces!! :) You can reserve a little to keep the meat moist if you have leftovers! Could you make this without a slow cooker? Stovetop? I’ve made shredded chicken before that way but I can’t remember how. Yes totally – you would want to braise it instead so just add a little more liquid and simmer it until chicken is tender. I made this tonight and it was excellent! We had it in tortillas with homemade mango salsa. So good. I’m already looking forward to eating it again this week some other way. At five and a half hours on low my chicken was fall apart tender when I checked on it. Will be a repeat recipe for us. Thanks! Oh I’m so happy to hear you enjoyed it Lynn!! Let me know if you try any other recipes of mine!! Hi can this recipe be don’t Sousa vide? I’m sure it could but I couldn’t tell you how! Is the amount of chicken correct? 3 lbs of chicken breast would be 9 breasts, which seems like way too much. Hi Kelly – This is actually part of a week long meal planning series and is meant to be used in three meals throughout the week. If you want it to just be for one meal simply divide the recipe in three. Enjoy! It depends on the breast. For me, 3 lbs was only 5 breasts. This is right up my alley! Citrus brightens everything right up. I’ve got some nice oranges left on my tree, I’ll have to give this a whirl. Ahhh I’m so envious of your citrus trees!!! Orange is such a great addition to asian chicken. Thank you so much! It really did turn out perfectly! I imagine this over some lime brown rice with mega does of cilantro. Delicious! So good right? Hope you had a great Easter!! Oh my word, LOVE the use of citrus with the chicken. So many possibilities too! This would make a great taco filling :) Or tostada. Or chicken sandwich. haha…..
hahaha right??? We made tostadas last week in Mexico and now I’m obsessed!! Thank you Liz for the nice recipe. Hope you’re doing well Liz!